Ice Moves is a rare 2-vs-2 minigame from Mario Party 7. Its name is a pun on the saying "nice moves". 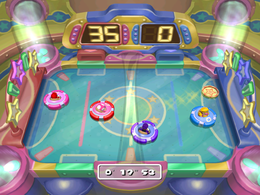 It is a two-on-two minigame similar to air hockey, in which the two teams try to shoot the puck into the opposing team's goal. The playing field is divided in half, so the players must stay in their own area. It is a timed game (the time is set by the first Player) and is not played to a certain score. There is also a one-on-one version of this game where only two players can compete. The amount of time the game will last is chosen at the start of each round. Rules – "Split into teams and play a fun hockey game. The team that scores the most goals is the winner!" Advice – "Tap just before you reach the puck to fire a slap shot at the opponent's goal!" This page was last edited on March 6, 2019, at 08:15.